This website has everything it is supposed to have: information on the service, price chart and calculator, terms and conditions, handy customer support and nice overall design. The only drawback is a bit too much filler text. 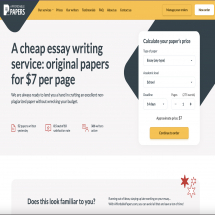 The service is called AffordablePapers for a reason: the prices here range from $8.95 to $31.95 and depend on the amount of time until the deadline and academic level. In fact, it looks even somewhat too cheap – especially in case of, for example, University level assignment. But still, the service is consistent about its overall policy. Don’t forget, however, that this price range does not encompass the increases because of additional features. The customer support is available via phone, chat and fax. The latter I didn’t use, but the other two methods seem to work perfectly – somebody answers you almost immediately, and it doesn’t take them long to think over your questions and deal with them quickly and professionally. Although the samples presented on the site are far from being masterpieces, they are grammatically and factually correct, don’t have any obvious blunders and can be characterized as reasonably well-written. Revisions are free for 7 days after the paper is approved, as long as you don’t change your requirements. In case of progressive delivery this period is extended to 21 days. With the exception of a bit too excessive filler text that makes it somewhat difficult to find the necessary information, this service seems to be almost perfect: low prices, helpful customer support, customer security, the site that makes it almost unnecessary to deal with the aforementioned customer support because everything you want to know is already written somewhere. The prices, however, may turn off more suspicious clients.